M.I.T.’s online magazine Undark recently published a deep dive story about efforts to undermine the teaching of global warming facts in public schools: In America’s Science Classrooms, the Creep of Climate Skepticism: Conservative groups are working hard to challenge the teaching of mainstream climate science in schools. In Florida, they’ve found a winning strategy. The writer, Sean Patrick Cooper, spent quite a bit of time with me in my empty classroom on a Friday afternoon. We had a long, wide-ranging conversation about the importance of teaching the facts about climate change in schools and how it’s a tough, uphill battle. Students come into school with no significant background in the subject other than possibly some misconceptions passed down through family and social media. They don’t really know anything about the basics of greenhouse gases let alone any of the more complicated concepts. When I teach it, I have to start at a very elementary level and build up from there as fast as I can. There’s surprisingly little time devoted to it in our curriculum map. Of course, I mention climate change throughout the year since it ties in with so many other concepts in my freshman environmental science class. But the time that is devoted to it alone is only a week or two. Something that didn’t make it into the story was this fact: depending on what school district and what school a student attends, there is a good chance that the student won’t take a science class that teaches the facts of climate change. Students in my school need three science credits to graduate. So, a student could start off with the state-required biology course, then move on to chemistry and physics. And that student will thus never encounter a single science-based global warming lesson. And what makes it even tougher is the outside opposition, which is what the Undark story goes into excellent detail about. Most of the story is set here in Florida because of the law we now have that requires all school districts to bend over backwards to hear out any citizen’s complaints about instructional materials. We fought hard against the bill as it progressed through the state legislature and onto the governor’s desk but ultimately lost. 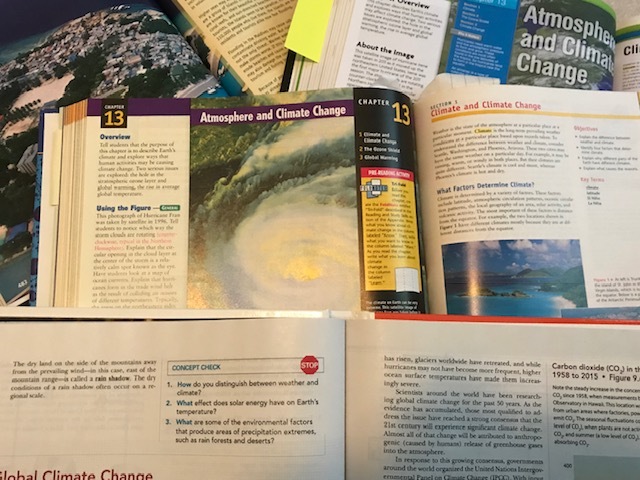 See our page “Challenges to evolution & climate change in textbooks” for an overview and links to our many blog posts written as events happened. The Undark story has a clear message for us that we need to heed. The outcome matters: Whoever wins over the minds of this upcoming cohort of American voters will, to a large extent, shape the nation’s policies on climate change for decades to come. Surveys suggest that more Americans than ever now understand the human-climate change connection, but as voters head to the polls for the 2018 midterm elections, more than 40 percent still remain unconvinced that climate change is predominantly caused by human activity. The best way to nudge that number higher, conservative groups seem to be wagering, is to target youngsters in America’s science classrooms. Leaders of the Florida Citizens’ Alliance said that with the new bill in place, they will be in a position to pilot and test different strategies deployed at school board meetings. They plan to refine those strategies with challenges across all of the state’s 67 public school districts. In other words, the fight has only just begun. The alliance was also featured in a recent Education Week piece: Citizen Activists Push to Revise History Textbooks. The Florida group now sends advocacy emails to about 20,000 people and maintains a network of activists in about seven of the state’s counties who keep tabs on local classroom materials adoptions; they are trying to build that number up to 15. About 60 Florida activists have been trained through the Truth in Textbooks’ training process, now conducted mainly online, to look for bias, “half truths,” factual errors, and omissions in the books. And then there is this story in PBS’s Frontline: Dueling Books Compete to Educate Kids on Climate Change. 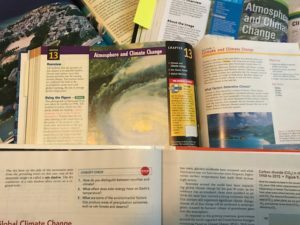 The group that mailed books and DVDs arguing that global warming isn’t real to science teachers around the country last year is redoubling its efforts: It plans to publish and distribute a new book — this one aimed at both teachers and students — in the coming months. Fortunately, we’re not alone in this fight. Florida Citizens for Science works closely with the National Center for Science Education and their awesome network of science defenders. And over the past few years FCS developed great working relationships with other groups, eventually joining with them to form Florida Education Defenders. But did you take note of the Alliance’s main tactic? They have volunteer activists set up all across the state ready to harass their local school boards about any and all textbooks under consideration for adoption. They have teams devoted to recruiting state lawmakers to their cause, resulting in 2018’s attempt to pass yet another law about textbooks and a nefarious “controversial theories” bill. You can guarantee they are already cooking up bills for 2019’s session. Science education in Florida obviously needs defenders. Are you ready to step up?